Let me start by saying that in Thor, like all other films based on Marvel Comics characters (the fact that I don't know the difference between Marvel and DC is a Point of Honor for me), there is a Stan Lee cameo and a short film sequence after the closing credits. Unlike other Marvel Comic film adaptations, it actually appears to be related to the movie itself rather than be an attachment to another film altogether (although we do have a notice that we haven't seen the last of our Norse hero, but more on that later). It's also a safe bet that this is the first Marvel Comic film that stars two Oscar-winners and is directed by a Shakespearean acting legend. With all this pedigree you could have one of two things: a disaster or a grand epic. Thor, the final product itself, falls somewhere in the middle. We plunge into the story, where Jane Foster (Natalie Portman, Oscar winner Num. 1) is out in the New Mexico desert, studying the stars. She and her partners Eric and Darcy (Stellan Skarsgard and Kat Dennings) encounter a massive storm, and as they try to capture it on film and then flee to safety they literally run into a big blond man. We then jump back into the backstory: Odin (Sir Anthony Hopkins, Oscar winner Num. 2) narrates about how he has vanquished the Frost Giants, and now he and his family live in the world of Asgard. In this world are his two sons, who grow to be Thor (Chris Hemsworth) and Loki (Tom Hiddleston). Thor, God of Thunder, is a thoroughly brash, arrogant man, quick to fight and slow to think. On the day Thor is to be announced as Heir Apparent, a group of Frost Giants (I think they have another name but like many in Thor too difficult for me to try and spell) attack, attempting to steal an artifact that will help them regain power. Thor, along with his friends/siblings/fellow deities (the script never specifies what they are) raid their world, and it's only through Odin's intervention at the last minute that they make it out. Odin, furious with his impetuous son, takes his hammer away (Thor's source of power) and banishes him, and we end up right where we started. Once on Earth, Thor is having a hard time understand that he is not the all-powerful being he was, barking out grand pronouncements and generally making a mess due to his cluelessness as to what realm he is in. Jane is both disturbed and intrigued by this stranger (and the obligatory shirtless scene Hemsworth gives us explains the latter), but Thor now bounces between two worlds (Thor's attempt to get his big hammer Mjolnir back after Odin flung it to Earth shortly after flinging Thor himself out, and Loki's conflicted machinations to take over Asgard) and I think three stories: the first two and the involvement of the super-secret government agency S.H.I.E.L.D. and its head, Agent Coulson (Clark Gregg). Thor eventually sees the error of his ways (how thought is just as importance as belligerence) and finds love, we discover a shocking twist involving Loki (which makes all his dealings less the work of a trickster god and more a confused being), and set up a confrontation between Thor/Loki, Thor/Frost Giants, plus a set-up for another film altogether. Thor, as scripted by Ashley Edward Miller, Zack Stenz, and Don Payne (from a story by J. Michael Straczynski and Marc Protosevich) is extremely busy and worse, extremely unfocused and chaotic. For its running length of nearly two hours including the obligatory closing credit scene, it never focuses on one story. We're bouncing between Asgard and Earth, which might work except that we have to deal with both Thor attempting to be more, daresay human, as well as all the dealings with S.H.I.E.L.D. Even then, things would work if there were interesting things going on in all three worlds, but sometimes there really isn't much to keep an interest. This is especially true whenever the script attempts a bit of humor. It works the first time when bombastic Thor attempts to declare his might against Darcy's "puny weapon" until he's brought down by her Taser. This bit suffers diminishing returns when he again attempts to declare himself the 'mighty Thor' before a tranquilizer is shot into his arm. When Jane runs him down for the second time, you kind of wonder why people are still finding this sort of bit funny. Worse, Thor presupposes a great deal from the audience in terms of plot. It presupposes that we already have a vast background on the Marvel universe by putting in details that for those of us who never read a comic book or saw any of the related films we simply wouldn't get. Take when Thor is about to try to take his hammer out from where it has lodged itself (The Hammer In the Stone, perhaps?). In this massive raid by our Thunder God Agent Coulson has a special hit man waiting to unleash his arrows. As I watched this scene (complimented with cinematically appropriate rain), all I kept wondering was, 'Is that two-time Oscar nominee Jeremy Renner in a cameo? What's this guy, playing some character named Burton, doing here except having fun being part of a comic book movie?' How was I to know A.) he was playing a character from another Marvel Comics series/movie, and B.) that his cameo was important because Renner was going to be in that other movie? In short, how was I to know he was playing the future Hawkeye? (Oops. If that was a spoiler for you, then I hand over my crown as the MegaNerd to you. The MegaNerd is Dead, Long Live the MegaNerd). I have no idea who Burton is, so having him pop up only once adds nothing to either my understanding of this epic mythology or Thor itself. Same goes for S.H.I.E.L.D. and Agent Coulson; if I hadn't seen the Iron-Man films I wouldn't know where this person came from. The fact that once we see the warrior Loki sent down to destroy Thor, a giant robotic-type creature, an agent asks Coulson, "That one of Stark's?" doesn't clear matters. For those coming into Thor without any background into the Marvel universe, certain characters and plot points will get lost. If you didn't get lost in the myriad of stories, you might get lost in all the visuals. Kenneth Branagh (the Shakespearean legend) drowns the visuals in vast excess. Asgard doesn't look real but totally CGI, as does the world of the Frost Giants whom I liken to an Army of Mr. Freezes from Batman (is that DC or Marvel?). I am aware that those worlds are fantasy, but when they look overtly fake it only takes you out of the film by its sheer falsity. The whole first act of Thor drowns in its visual grandness which really ends up looking empty. As a corollary to the script problems, we never get a sense of who the secondary characters are. I don't think I learned the names of Thor's warrior sidekicks. I don't even I learned their relationship to him or to each other. Were they family? Were they merely friends? Who were they? I guess those behind Thor expect me to know all that information, and the fact that I don't hampers my ability to care about any of them. If all that isn't enough, the fact that a movie could make no use for Rene Russo as Asgard Queen Frigga is unintelligible. She was on screen for probably less than five minutes, definitely less than ten, and so unimportant to the story she could have easily been written out without affecting whatever flow Thor had. Despite the overwhelming sets (particularly Asgard but the S.H.I.E.L.D. camp as well) and Patrick Doyle's sometimes overwhelming score (again, I don't trust a movie where the music is almost constant), Thor has to its plus column some exceedingly good acting. Branagh I think is a far better director of people than he is of visual epics in Thor. I did worry when I first heard Hopkins narrating the film: it brought back memories of the abysmal Alexander. I figure Hopkins is the type of actor who can either be brilliant or camp: it depends entirely on the director. When he has a good director, he is brilliant (case in point: Silence of the Lambs). When he has a bad one, he can devour the scenery like an orphan at a candy shop (case in point: Alexander or The Wolfman: although in the interest of full disclosure, I did enjoy the latter). In Thor, he veers close to camp but Branagh manages to keep Hopkins just short of it. I didn't like his 'dying' scene, but barring that, his performance as the wise king but troubled father worked well. The best performance came from Hiddleston. His Loki isn't a clear-cut villain but a far more complex character than most comic book antagonists (although there are exceptions, such as Ian McKellen's Magneto from the first two X-Men films). One of the factors I use to judge whether a performance is successful or not is whether I care and believe the character in spite of rather silly costumes. Here, Hiddleston passes both tests with flying colors. Loki is not entirely malevolent but more of a jealous and wounded younger brother, who loves his family but also harbors resentment against them. Another great performance is that of Hemsworth. Thor starts out as brash and foolish, arrogant to the point of endangering all the worlds in order to vindicate his sense of right through might. While the character might have in some other hands come off as thoroughly unlikeable, Hemsworth creates a being who has learned humility, who has evolved. 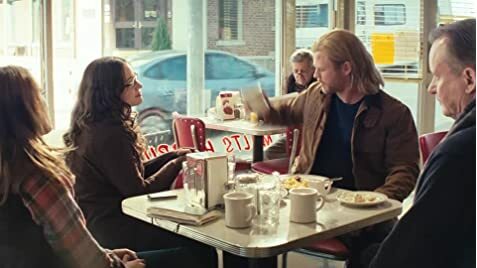 If the script had kept a stronger focus on his interaction with humans (and not have them all be comedic) Thor would have been a far better film. Hemsworth's Thunder God manages to make the evolution of the character believable and more importantly, one that we care about. I'm not sure he is an actual actor, but at least he is as good a Thor as we're going to get. In short, Thor has better performances than this film deserves. This isn't a universal virtue though: Portman isn't good in the film, but I would put that on the fact that she isn't given much to do in Thor rather than on being a bad actress (which she isn't). Thor isn't a bad comic book film like X-Men: The Last Stand or Superman IV: The Quest for Peace, but it is not in the same league as some truly brilliant classics like Superman: The Movie or Batman Begins. The story is too unfocused (we never get a clear idea as to who many characters are and the fact that Thor has to be force to fit its characters into another film makes it look like nothing more than a trailer for The Avengers, right down to ending the film with the title caption "Thor will return in The Avengers" a la James Bond) and the visual vastness overwhelms the characters. However, the performances by Hemsworth and especially Hiddleston brings it up a bit. Ultimately, whatever human story there could have been in Thor is short-changed, making this film less than the sum of its parts. You really have to be Loki to love it.